Since my household recently purchased a complete box set of the James Bond films, we’ve begun a total re-watch of the entire series. So, I’ll be giving my thoughts on each film in turn. First some background: I’m a long-time fan of the Bond films. I’ve seen all of them (except Quantum of Solace) at least once and have a fairly good working knowledge of the history and background of the films, though I haven’t gotten around to reading any of the books yet. So, we open with the very first of the mainline Bond films: 1962’s Dr. No, in which James Bond travels to Jamaica (the Caribbean was a favorite haunt of Ian Fleming’s and a common setting of the series) to investigate the death of a British agent investigating mysterious radio interference with American missile tests. What struck me most on this re-viewing was simultaneously how down-to-Earth it is compared to many of its sequels and yet how complete it is. The classic trappings of the Bond formula are almost all there in full force; M, Moneypenny, Felix Leiter, the casino, the exotic locations and high living, the women, and the oppressively powerful villain with his private army of henchmen. Only Q, and with him the emphasis on gadgets is yet missing. Also, the opening credits are instrumental rather than accompanied by a song, and the gun barrel sequence is slightly off in that it opens in silence. More than that, the character of Bond bursts onto screen essentially complete; there was never a part where I thought “Well, Bond would never do that in later films.” On the contrary, watching this time and paying closer attention to the details of his characterization, I realized just how strongly marked a character he really is, perhaps not in depth, but in style and personality. We’ll come back to that. Yet, as I say, this film is comparatively restrained when contrasted with its sequels. It in fact takes more the form of a detective story, with Bond spending most of the film pursuing leads and trying to trace the footsteps of his predecessor, Strangeways. He’s even referred to as a detective more than once (Dr. No eventually dismisses him as, “just a stupid policeman”). The emphasis is more on Bond’s cunning and cleverness than on his fighting prowess: the action scenes are generally pretty short and restrained, while scenes like Bond’s verbal fencing match upon meeting Quarrel (the first of many local Bond allies) or his interviews with the slimy Professor Dent take up much of the first and second act, interspersed with more quietly suspenseful scenes like Bond waking to find a venomous tarantula in his bed. The third act ramps up things a bit, but still remains pretty low-key and realistic (including a tense pursuit through a swamp that ends with Bond knifing one of the guards commando-style). Partly for this reason, I was struck by just how good the movie was, and how effectively it tells its rather complicated plot and ushers us into the world of Bond for the first time. In the very first minutes of Dr. No we discover that a man at a British gentleman’s club is a spy, and then see him gunned down by what seemed to be three blind beggars. The stage is set; we are in a world where appearances cannot be trusted and death is a moment-to-moment possibility: a hidden world of spies and counter-spies operating just out of sight of normal people. This is immediately followed by a scene of men and women working at a radio switchboard, identifying that something is wrong, and passing the information along. They’re dressed in normal work clothes and deal with the disappearance of two people in a calm, professional matter by referring it to the correct channels. It is a short scene that most people probably forget, but it is also important; the apparatus of spy work is, fundamentally, not a cabal of supermen, but a job like any other, carried out, for the most part, with cool routine and procedure. This is an idea that the films will return to again and again, and it is here established almost immediately. From there we go to a high-end casino, where we receive our unforgettable introduction to, “Bond…James Bond” (apparently, this immortal line and its delivery was worked out by Sean Connery himself when he found the original version of the scene too dull). As I’ve said, what is remarkable is how complete Bond’s character is from the start. To take an illustrative example: when Bond first arrives in Jamaica, he finds a man with a car waiting for him, ostensibly from the government. He coolly excuses himself without arousing the man’s suspicions and calls his contact to check whether a car has in fact been sent for him. Finding that none has, he goes back to the car and gets in anyway. He then grabs the chance to turn the tables, easily outfights the man, and proceeds to interrogate him (a cyanide-laced cigarette prevents him from getting any information, establishing the fear Dr. No inspires in his underlings). This is a pattern that will recur throughout the film and indeed the series: Bond never takes the safe option. Instead, he prefers to walk into danger with his eyes open, trusting to his skill and his luck to get the better of his opponent and thus to learn from them. Bond is not looking for safety, but information, and in the hidden world of spies he needs to skate shoulder-to-shoulder with the people trying to kill him in order to get it. If he discovers a trap, his instinct is not to avoid it, but take the bait and try turn it to his own advantage, which he more often than not is able to do. It is a high-risk, high-reward strategy: the personality of a born gambler. Casting Sean Connery was brilliant, not only for his acting chops and rugged physicality, but also for the rough air that came from his poor background. As implied in the early scene at the switchboard, Bond is fundamentally a workingman: a civil servant with a paycheck and a pension (despite the fact that he actually comes of a high-class family, as will be revealed later in the series). Connery, himself a working-class man in a job that causes him to adopt an air of sophistication, brings the perfect balance to the role, so that both elements are there, but so blended that it’s impossible to tell where one ends and the other begins. This is the strange, potent blend that makes Bond so interesting; he is simultaneously rich and sophisticated, a gentleman of wealth and taste, and also a workingman, living by his wits and his luck, with earthy, human appetites in alcohol, women, and food (granted with high standards in all three). He combines in one person Jack the Giant Slayer – the cunning peasant who overcomes enemies ostensibly far above him through use of his wits and taunts them when he’s finished for good measure – and Sir Lancelot – the high-born knight of unquestionable loyalty and unmatched martial prowess who follows court etiquette to the letter. I don’t think any culture but England could have produced such a hero, which might be one of the reasons he has taken such a place in the popular consciousness. Of course, he’s not a classical hero, like a knight of old: morally, he’s closer to a brutally pragmatic pagan hero, like Achilles or Odysseus. He kills his enemies in cold-blood (and even shoots the corpse of a dead enemy at one point as a final insult). He lies continually and without turning a hair, whether he needs to or not. And, of course, he shamelessly flirts with and sleeps with women as the mood strikes him, or as a strategy, and he’s perfectly willing to rough them up to get information. But, at the same time, he has real virtues. He cares for his friends, is unshakably loyal to his country, and sincerely believes in the justice and freedom he is fighting for (when he meets Dr. No, he sneers at people who think they’re “Napoleon. Or God,” and comments that No’s disregard for human life suggests he’s working for ‘the East’). He’s also shown to be fairly generous and respectful towards servants and the poor (as seen when he drops generous tips to the staff at the casino). And though he sleeps around with many different women, he also makes a point to protect innocent girls like Honey Rider, the shell-collector he meets at Dr. No’s island. Once she shows up, he tries time and again to get her to safety or to protect her against the bad guys, and he treats her, as far as the film goes, very kindly. Honey is the first main ‘Bond Girl,’ and her introduction, rising from the sea like Venus, is one of the most famous images of the series. She really doesn’t have anything to do with the story, except giving Bond someone to protect, but she is a comparatively rare Bond girl with an actual backstory (daughter of a marine biologist murdered by Dr. No), and she’s certainly a pleasant enough character, and giving Bond charge of an innocent party is a good way to keep the film’s rather shaky moral premise intact and emphasizes that there is a world of difference between Bond and his adversaries. Whatever nasty things Bond does, he ultimately does it to protect the innocent people that the likes of SPECTRE would abuse, exploit, or kill. As for Dr. No himself, again we see the trappings of the Bond franchise are remarkably complete here in the first of many vivid Bond villains. He has comparatively little screen time, but his presence as an ominous, unseen force that drives people to suicide for fear of displeasing him, hangs over the whole film. He is introduced as a disembodied voice rebuking Professor Dent in terms that assure him (and us) that he knows far more of Bond’s investigation than he ought and considers himself completely in control of the situation. And, despite all of Bond’s strength and skill, he makes good on that assertion for almost the entire film. Played with cold detachment by Joseph Wiseman, Dr. No, like so many subsequent villains, takes an opposite approach to Bond. He is a chess master and scientist, relying on his brains and organizational skills to control his environment to his own advantage. He speaks in a soft, calm voice, almost a monotone, wears a featureless suit, and has powerful robotic hands. All this marks him as having largely sacrificed his humanity for his own goals, in contrast to Bond, who retains his natural appetites and enjoyments, his sense of humor, and some fundamental ideas of right and wrong. Dr. No, though not on screen long, makes a powerful impression and even after some twenty-four films, he stands as one of the great villains of the franchise. Not only that, but he serves as our introduction to the legendary SPECTRE organization, which will be pursuing Bond through most of the early films. We’ll talk more about them as things go on. Though I mentioned the film’s remarkable sense of completeness, there are a few signs of it’s being the first of a series. The film opens with Bond trading in an old Berretta for his trademark Walther PPK, for instance, and he later is shown meeting his perennial American ally Felix Leiter for the first time (Bond specifically comments that he’s “heard of Leiter, but never met him” at this point). Leiter himself is slightly more antagonistic towards Bond than he would be later on, with some mild jockeying over whose jurisdiction No falls under. The scene where Bond receives his Walther is another example of the film’s efficiency. It rapidly and naturally establishes the capabilities of the firearm, the fact that Bond is an experienced field agent, but not invulnerable (it’s mentioned he was in hospital after a previous mission went south), and that the double-o designation means he’s licensed to kill. It’s not perfect, of course (I don’t know that any of the Bond films will make a ‘best of all time’ list, though some, this one included, would easily land on a ‘best action-adventure films’ list). There are things like how, as mentioned, Honey Rider has no story purpose in the film at all, or that Bond seems to escape No’s cell and foil his plan rather easily after all that build up, or the moments where the film’s comparatively low-budget shows through, such as the unconvincing green screens during the car chases. It probably could stand to be a little shorter, and depending on your taste in music the song ‘Underneath the Mango Tree’ will probably start to grate on you long before the film is over (the ‘Three Blind Mice’ song that opens the film is much better, to my tastes). But despite these problems, even after all these years I’d still consider ‘Dr. No’ as one of the best of the Bond series. It’s a strong opening act setting the tone for a long journey. I’d like to introduce you to actress Mie Hama. She’s a rather interesting person: born during World War II to blue collar parents, her home was destroyed in a bombing raid and she grew up poor. By the age of sixteen, she was working as a fare collector on the bus, and it was there that Producer Tomoyuki Tanaka found her and decided she might make a fine actress. Anyway, Miss Hama went on to become one of the most popular actresses of the Golden Age of Japanese cinema, and even to have some success outside it (more on that later). But at the height of her career she quit acting to get married and start a family, wanting only a “normal life.” She had four children and later became a popular TV and radio host, authoress, and advocate for traditional Japanese farming. Now, Miss Hama has a peculiar distinction in the film world. As far as I know (and all things considered, I think I would know), she is the only actress to date who has been menaced by both King Kong and Godzilla, AND romanced by James Bond. (To be fair, Akiko Wakabayashi also co-starred in You Only Live Twice – and plays a rather larger role – as well as having a role in King Kong vs. Godzilla, but she never interacts with either of the monsters). Akiko Wakabayashi. Seems only fair to put her photo up as well. Miss Hama was one of the stars of 1962’s King Kong vs. Godzilla, during the course of which the train she is riding is wrecked Godzilla, who then briefly (and presumably inadvertently) pursues her into a ravine, where she’s rescued by her boyfriend. Later, as she tries to evacuate Tokyo before the approaching King Kong, she boards another train, which unfortunately runs directly across the path of the giant ape, who does what he does. Somewhat fortunately for her, Kong notices her and takes a liking, meaning that she gets to serve as this film’s version of Fay Wray (Kong climbs the Diet Building in this one). Kong is then knocked out by gas bombs and she is rescued before the great ape is airlifted to his showdown with Godzilla. 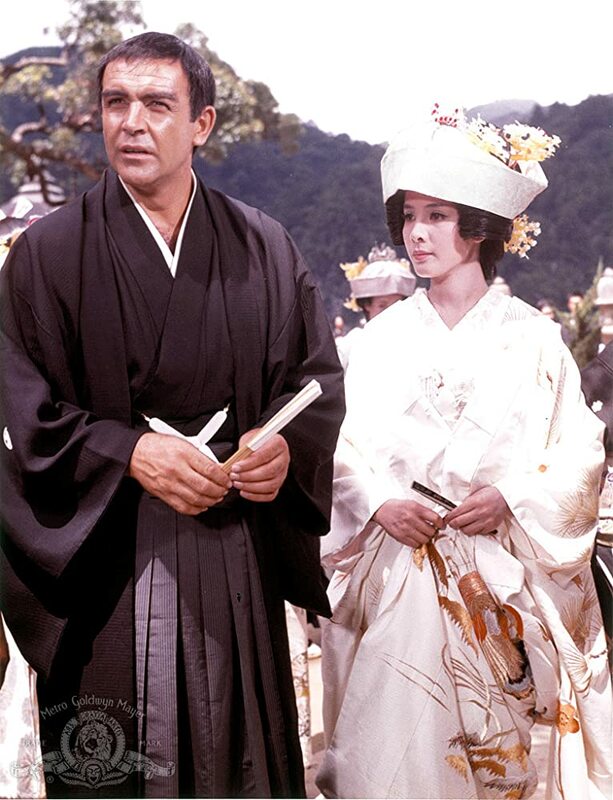 Some five years after tangling with the two greatest monsters of cinema, Miss Hama was picked to co-star alongside Sean Connery (and fellow King Kong vs. Godzilla alum Akiko Wakabayashi) in You Only Live Twice, the fifth James Bond film. She plays the role of Kissy Suzuki, a Japanese agent assigned to pose as Bond’s wife while he’s undercover as a 6’2″ Japanese fisherman (granted, not the most convincing development in the history of the franchise). Kissy doesn’t really have a lot of screen time (she isn’t even introduced until an hour and a quarter into the two-hour film), but she manages to put what time she has to good use by steadfastly, and amusingly, resisting Bond’s attentions until the very end (“We’re supposed to be married!” “Think again, please; you gave false name to priest.”) and providing some solid back-up for Bond during their reconnaissance of Blofeld’s base. That, and spending about 90% of her time in a bikini. Miss Hama later told stories of how difficult the experience of being a ‘Bond Girl’ was. Though she was a popular actress in Japan, she was still a fairly normal, down-to-earth person and so found herself overwhelmed by the publicity and pressure of the big Hollywood production. But, she said, Sean Connery – who also had a working class background – was very kind and chivalrous to her, constantly checking to make sure she was okay and looking out for her during the long shoot. Later she commented that her chief regret about the film was that she was too shy to try to get to know him better. That same year, she tangled with Kong again as the villainous femme fatale Madam Piranha in the delightfully silly US-Japanese co-production King Kong Escapes (which is basically what happens when a King Kong film and a James Bond movie are put through the brundlefly machine together). This time around she’s a bad girl: a spy from an unknown foreign power in league with the villainous ‘Doctor Who,’ who intends to conquer the world with a mechanical copy of Kong (so, yes; it’s a pseudo-Bond film where King Kong battles Doctor Who, a Bond Girl, and MechaKong. Japan, ladies and gentlemen!). Be honest; would you accept a drink from this woman? So, there you have it; the girl who tangled with King Kong, Godzilla, AND James Bond and lived to tell about it. Now that’s a strong woman!